Ugh, so painful. I had a 21-month MMMM streak going into this month, and have been taunting Pete to “bring it on” on an almost monthly basis. And now 76 solvers have gotten the 2016 June MMMM, and I’m not one of them. The title is “Prime Directive,” and I’ve tried everything. I circled the 13 starred entries and looked for patterns. I circled all the prime numbered clues. I circled all the prime numbered letters (2, 3, 5, 7) within the starred clued. Nada. Zippo. ***It’s probably not something spelled out in the fill, since the 13 starred entries are very constricting and I’d be quite surprised if they left any room for fill to affect the meta in any way. ***The clues are slightly weird — all the “repeated lyric 30 or 40 times” references in the first three — but I couldn’t find an in there. But I’d be not-that-surprised if it turns out to be something in the clues since there were some odd phrasings (e.g. referring to MEXico as a “sovereign” country seemed like a pointless extra word). *** I will also not be surprised if turns out that the six pairs of symmetrically-placed theme entries play off each other in some way, and the contest answer plays off BRICK in the middle in the same way. I can’t make this work but I won’t be surprised if it’s the key. *** I’m really depressed and annoyed at not getting this. I get e-mails all the time from people who solve my weekly meta at how I “ruined” their weekend with a tough meta, but I completely get it. I’ve been looking at this thing off and on for the past 96 hours and it’s upsetting not to get it, especially since I have a 21-month streak on the line. In the wider scheme of things it’s of course trivial, but that’s not much consolation. I don’t like missing this and seeing that 76 others have gotten it (and seeing their triumphant tweets!) doesn’t help. My random guess is Stevie Nicks’ “Edge of Seventeen” since it has a prime number in it and “edge” could be crosswordily suggestive. I’m not optimistic. Alright, someone tell me what I missed it comments. I admit defeat to our Meta Maestro. POSTSCRIPT: Ugh. I hate myself. Just temporarily, but still. After I submitted my incorrect guess Pete e-mailed me the answer. It was the only thing I hadn’t tried — string the thirteen theme entries together and count the prime numbers from there and they spell out the Police’s DON’T STAND SO CLOSE TO ME. I should’ve had this. I tried everything to do with prime numbers except this. To everyone who’s had this experience with my metas, I’m really sorry. It’s a terrible feeling. Pure anguish. This was a thing of beauty. Number all the letters in the answers to the starred clues. Then circle all the letters that have a prime number. Arg! My streak was much shorter, but it also broke here. I thought: “a hit from the 80s”, why not “a hit SONG from the 80s”? Is a hint that it’s an instrumental (no words), just as “isotope” was clued as a “tune” and not a “song”? 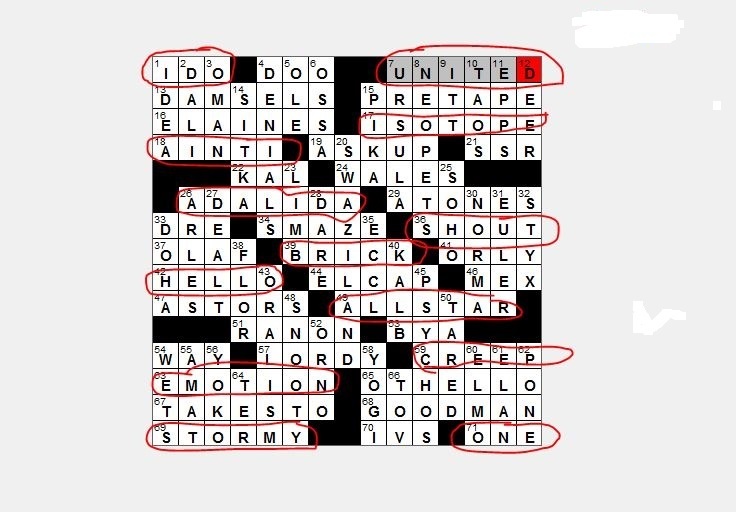 Also I thought “I do”, “united”, “one” and the song “marry you” from the album “doo-wops…” was also a hint. I feel your pain. I mean, I really feel your pain since you’ve caused me very similar pain in the past! I also feel your pain Matt. Last year I had a perfect MMMM streak going until December. I won’t give away the solution here, but suffice to say, I just could not see what was going on. When I saw the answer, I wanted to kick myself for not getting it. Hopefully this year things will be different. Well played Pete! Outstanding piece of work. ARGH!!!!! I saw “Prime Directive” and was like STAR TREK!!! Started digging around into Starship, Journey’s “Frontiers” album, entire lists of songs about sci-fi and outer space… nothing. Nada. It never crossed my mind to think of prime numbers. Amazing puzzle. Kicking myself over it. Pete is a genius. One of my false paths – two of the starred entries could have their “prime” letters changed to produce SPOCK and SCOTTY. But no. I tried the prime letters in each theme answer too, but didn’t think of stringing them together. Ultimately submitted “867-5309” – it’s prime and from the 80s, but nothing else points to it. Ah, well. I too guessed (“guessed” being the operative word) “867-5309” with nothing to back it up… well, a couple of force fits, like two instances of “TONE” (like Tommy Tutone). Then the next day I looked at it again and got the right answer. Alas, Tu-late. 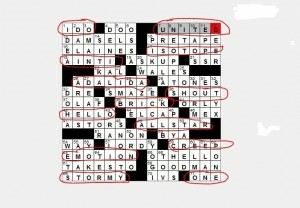 From a mediocre crossword fiend, this month I had the reverse happen…..solved a difficult meta. I suffer a lot of anguish, but the thrill is soooooo worth it. Thank you to all creators. For what it’s worth, I feel this puzzle was intentionally designed to try and throw experienced meta-solvers off. There was a TON (in my opinion) of extra things like the repeated title words that hinted at something going on that in the end didn’t pan out. I finally got it after HOURS of working on it, and was of course relieved, but on the other hand I wouldn’t say this was a click so much as trying tons of things until one worked. I was surprised that experienced meta-solvers had so much difficulty this month (I agree that they did, with Matt missing and Jangler taking much longer than normal). I thought that with “prime” in the title, there were only a few things to try before stumbling on the correct answer. But counting only the letters in the theme entries turned out to be less obvious than I thought. I did intend the repeated title word mention in the clues to be a red herring. Almost everyone that solved it really seemed to enjoy the “aha” click on this one. Sorry you weren’t in that camp! Beautifully done Pete! Excellent idea for a meta. Finding 13 theme entries to align with the prime numbers is quite an accomplishment . Thanks for working your magic! I didn’t figure it out either, Matt. Solidarity! though I did not get this one, I must say Pete deserves a lot of constructing kudos for it. I feel like trying to take some other 20-letter song title and see if I can fit it into a 71-letter string of 13 other song titles …… does NOT appear easy …… and THEN the 13 song titles need to include 6 pairs of same length? Dang, outstanding puzzle! !